10 Today's Veterinary Business Business Business FINANCING "Affordability can be a primary barrier for pet owners when de- ciding on a procedure," said Patrick Keefe, director of veterinary health for the health care financing compa- ny CareCredit. "If a client's concern regarding cost is resolved early in the decision-making process, they may be more likely to accept rec- ommended treatment. If cost isn't resolved, clients may delay or not accept recommended procedures." Neil Stanga, vice president of business development for Scratch Financial, pointed to a 2017 Bankrate report that showed nearly 6 in 10 Americans didn't have enough sav- ings to pay a $1,000 veterinary bill. "With that in mind, it isn't sur- prising that pet parents decline 51 percent of veterinary proce- dures above $1,000," he said. "It's estimated that as much as $31.5 billion in veterinary treat- ment was foregone [in 2016]." Options to Help Clients Pay Offering in-clinic payment plans is one way to ensure a patient gets the care it needs, but the collec- tions process can take up the front office staff's precious time and energy. Clients might need months, if not years, to pay off their balance, and all too often they simply stop paying, forcing clinics to either write off the amount owed or turn to a collection agency. inquiry on their credit report even if they're declined," Stanga said. "Scratch isn't a credit card, so cli- ents apply without affecting their credit score. Many of our custom- ers are people who don't want another credit card." Easier Approvals In decades past, ap- plying for third-party financing was often cumbersome. Veter- inary clients had to fill out lengthy paper applications, and then the front office staff spent significant time inputting the informa- tion, running the credit inquiry and waiting for a response. Today, clients can quickly and When pet owners can't afford to pay for veterinary services, everyone suffers: the patient, which might go without proper medical treatment; the client, who can't help the pet and might consider euthanasia in place of costly treatment options; and the clinic, which misses out on the revenue. Partnering with one or more third-party financing companies can be a win-win for patients, clients and clinics. Terms vary by company, and clinics might be charged enrollment, merchant or transaction fees, but in general, the hospital is paid in full when a client opts for third-party financing of veterinary expenses. Scratch Financial supplies a loan rather than a line of credit. 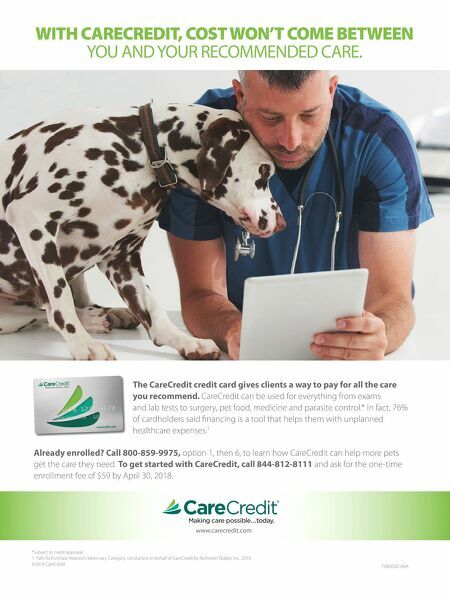 "When someone applies for a credit card, it leaves a hard By Jackie Brown When the treatment plan for a sick or injured pet will run into the thousands of dollars, informing the already emotional owner can be difficult. 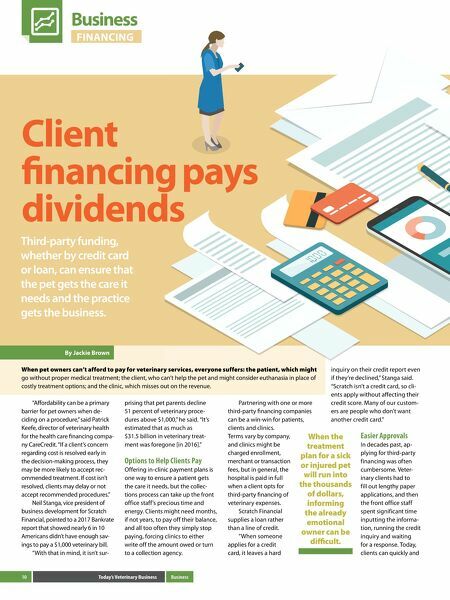 Client financing pays dividends Third-party funding, whether by credit card or loan, can ensure that the pet gets the care it needs and the practice gets the business.